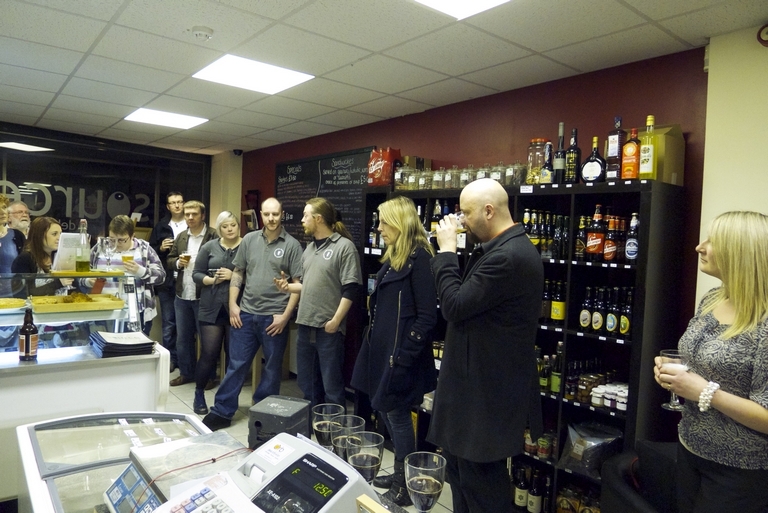 Saturday the 29th January saw the first "The Ormskirk Baron presents" beer night hosted at Source Deli. The first brewery to get the Baron treatment was the excellent Marble Brewery from Manchester. 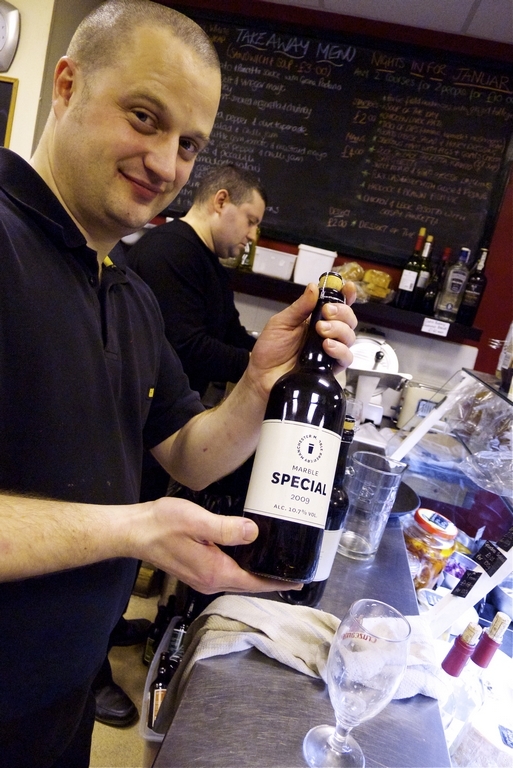 @Christopher_R & I were running the event, we arranged with Source Deli to source the five regular Marble bottled ales as well as giving everyone a taster of the 2009 Special. I've met Colin from Marble a number of times and so asked him if they would like to attend the evening which they said they would love to, and they also mentioned that they should be able to bring something interesting along for people to try as well. The Saturday arrived and Chris & I made our way down to Source Deli for 7pm (night was starting at 8pm) along with Paul from AlesByMail who came up for the event as well. Paul from Source Deli was sorting the tables out, and generally getting things ready so I placed down my 'group baron rating' cards and bowls (more on these later). 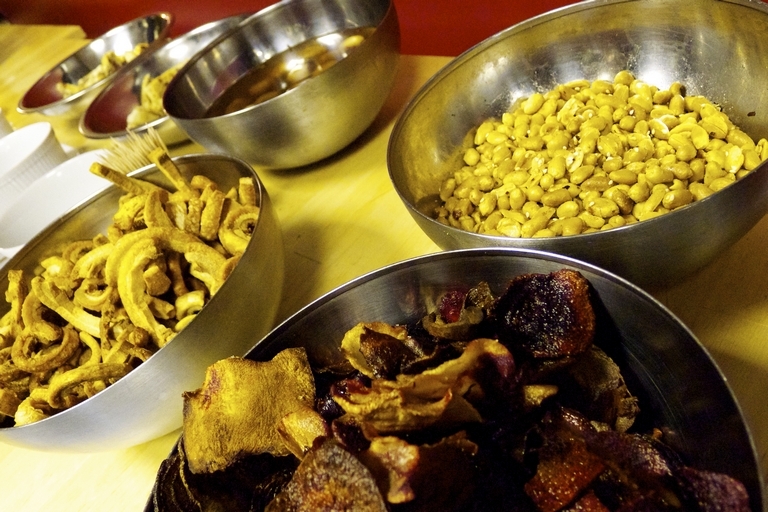 Matt from Source Deli then appeared placing some bowls of 'bar snacks - Source Deli style' duck sausage rolls, veggie crisps, roasted nuts and the most sharp pickled onions you've every tasted! James & Colin from Marble arrived with Colin sporting a Demijohn of cool looking experimental beer as well as a crate of unlabelled bottles. The Demijohn contained with Lagonda IPA dry hopped with Citra, and the bottles were their Ginger ale brewed with a German yeast instead of an English one. These beers along with the brewers showing up were not publicised when we were selling the tickets so I was pretty chuffed that we could over deliver on our promise of a Marble beer night! Doors opened at 8pm and each of the 20 attendees were handed a real marble on entry in exchange for their ticket. The marble was used to 'baron rate' each beer tried as well as a token to swap with Source Deli at the end of the night for a bottle of their favourite Marble beer. The beer line-up for the evening was: Manchester Bitter,Lagonda IPA, experimental Lagonda IPA dry hopped with Citra, Chocolate Marble, Dobber, Special 2009, Ginger, experimental Ginger hefeweizen-style. We kicked off the evening by introducing ourselves and explaining what the evening was about, introduce the Marble brewers and explained about the group baron rating and the use of the Marble. Then it was time to get the caps off the bottles of Manchester Bitter and pour each person around half a bottle whilst James & Colin explained a bit about the beer to everyone. Each beer got pretty much the same treatment: an introduction from the Marble guys, half a bottle to sample then a quick rush to the bowls for people to place their marble to indicate their 'baron rating'. The dry-hopped Lagonda was excellent, it retained the fresh citrus-ness that Lagonda IPA has but also added an additional lemony lift in the finish, it was really rather nice and the 'baron ratings' for it below indicate that most people thought the same. The experimental ginger was really interesting, Colin explained that it hadn't had the 'gingering to hell and back' that the normal bottled ginger gets but the German yeast really brought in some cloves and banana and gave the whole beer quite a lift. There were quite a few ladies at the event which was really encouraging as well as quite a few women who classed themselves as non-beer drinkers who didn't like beer! Chris & I were pretty worried about these people, wondering why they bought a ticket to a beer event but they seemed to find a few the really liked including one lady who's favourite was Dobber - not a 'small beer' by any imagination! There was an excellent buzz about the place and Paul & Matt from Source Deli were really happy with how the night was progressing. Chris & I too were so happy that everyone appeared to be really enjoying themselves and the brewers were getting some feedback from everyone as well - I think everyone enjoyed themselves which is the main thing! Source Deli are already talking about the next "The Ormskirk Baron presents" event so watch this space! A good night was had by all; and thanks for posting a picture that hides the other chins, this is a rare commodity. Looks like a great night!! Very cool that you got Colin and James along and to bring some specials. I'm sure you've turned many new people towards the delights of Marble with this! Seems like a top night mate, well done for having the balls to organise in the first place! Thanks guys for the comments, we really enjoyed running in and WILL do some more brewery-focused tasting nights at Source Deli later in the year. Paul & Matt are expanding their beer range at the moment, new beers in are Stringers and Hawkshead and they already stock Marble, George Wright & Liverpool Organic. Well done lads sounds like everything went very well. 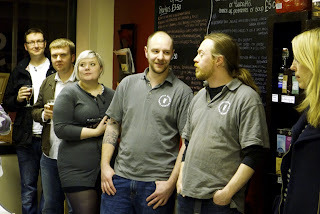 Even if you're not a beery-type listening to passionate people talk about the thing they love is always interesting. I've been playing around with the idea of proposing a beer and cheese matching event with a local deli for Saltaire Festival this year. Beer & cheese is a really interesting idea and one that we were floating to run at Source Deli before Christmas. I asked around a bit but most of the people I asked didn't seem that interested. I suppose if there was a stall where they could come and try a bit without the £20 a head charge that we would have asked then it might be more successful. Great write up, interesting to see how the scores worked out also. Thanks Baron, was a great night!